new things. | Anna Allen Clothing Blog: new things. I am working hard to get some new things made for the shop. New dresses and tunics mostly. And yes, more gingham! The time change has thrown me off a bit and I find myself making another cup of coffee in the afternoon. I am technically not supposed to make more than one cup a day (my own little rule...hah) but sometimes you just need that extra little "push" to get you through the afternoon. With the coming of spring brings many new things. The house is every which way as my roommate packs up her belongings to move into a new place and a new life. She will be missed! That leaves me with very little here, but I like it that way. I am finding endless amounts of inspiration from the lovely Ms Cumberbatch of Pure Style fame. I ordered a few more of her books and there are instructions in one of them on how to make slip covers for the chairs and couch. I already have a list of things to make this summer and many of them are included in her books. Paint [video] the dining room table/chairs white, make slip covers for the old couch, reupholster the chairs... Will I get it all done, do you think? We shall see. Summertime is almost here and I already have it pretty filled up. One of which is getting married! So yes, a full summer indeed! I'm totally the same way when it comes to coffee. A cup in the afternoon keeps me going! The BBC P&P is a long time favourite, I need to watch it again. Yay to Gingham! Loving this lovely shirt. Did you design it? Or is it a pattern you can share? Your tunic is gorgeous--my philosophy is that you can never have too much gingham! Love the top!! I love gingham and coffee. so beautiful! i love the fabric and the style drapes so well...a great fit to. Where did you get your bedspread? I love it! oh! a dress version. looks perfect. and you know i love my shirt so much. Sounds like a great, productive week! My weekend is just starting...and I need to clean my house since it's trashed from the week. Such a beautiful shirt. You have so much talent making all those beautiful clothes. They have a style I've not seen elsewhere, such old fashioned beauty. Thank you for sharing! 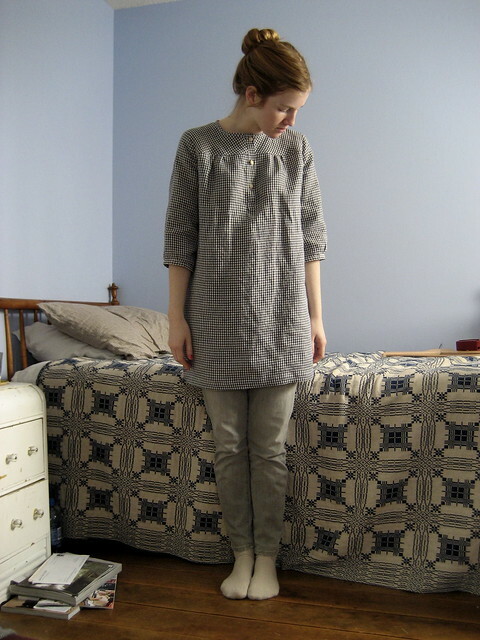 this is such a beautiful tunic, i love the gingham! Beautiful picture. I love the tunic you're wearing. it's super cute. Is there such a thing as too much gingham? I think not!! Lovely top, Anna. I can't wait to see what else you create! that dress is adorable. and, in my opinion, you can never have too much gingham!! ever!